I guess I should acknowledge that I am past the 100th post! Woooo-hoooo! Today I woke up wanting to bake but I had no idea what to make. Given my super packed schedule including Just Dance 3, tanning and coffee with friends, I didn't have too much time to spare. Oh, and I also had to pay a visit to the dentist--one which I always dread. But when I mentioned the urge to bake to my mother, she quickly jumped at the opportunity. She asked me to make her granola. I said sure. Here is the recipe for a quick granola that tastes great atop fruit and yogurt, sprinkled on a salad, or even on its own. 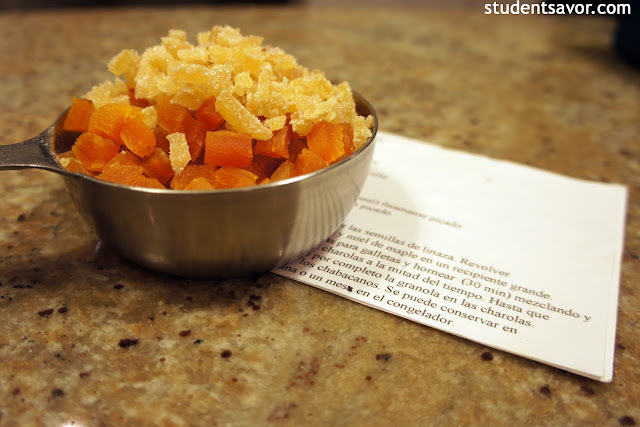 Pros: it's simple to make, it's plenty, and it makes the kitchen smell amazing! Cons: it will most likely be gone quickly. In a large bowl, mix oats, almonds and seed with oil, maple syrup and salt. Stir with a wooden spoon until combined. 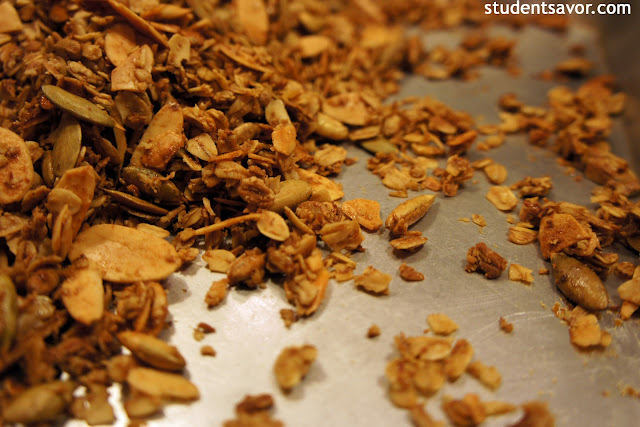 Spread granola on two rimmed baking sheets; place in oven and bake for 30 minutes, stirring halfway. 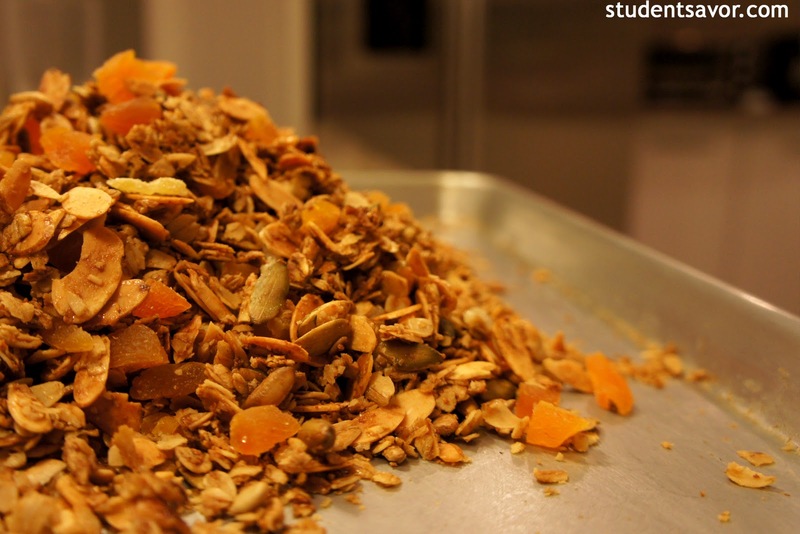 Remove granola from oven and cool completely on sheets. Add apricots and ginger and toss to mix. 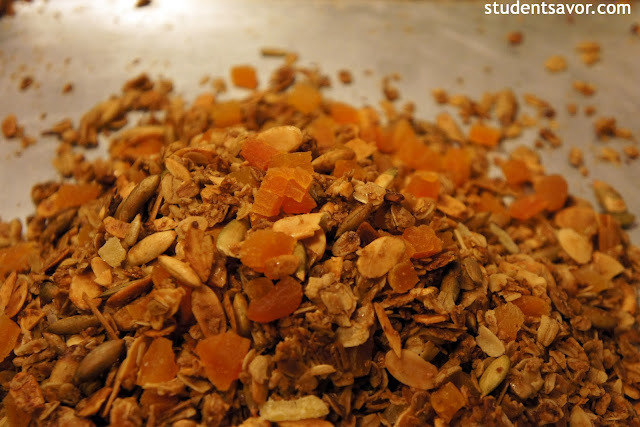 *Granola can be stored in an airtight container for up to a week or frozen up to 4 months.